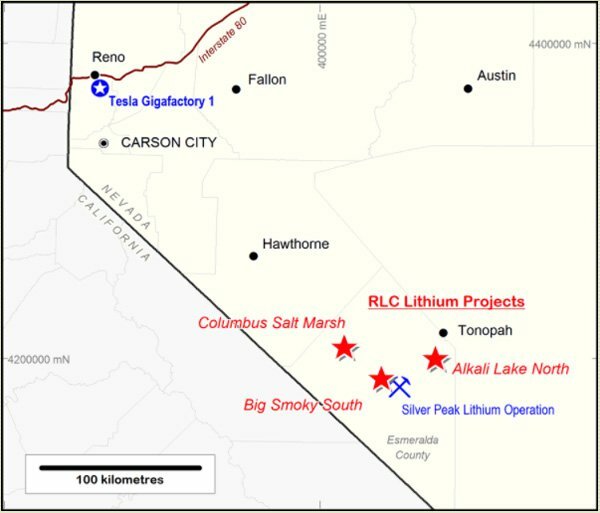 Reedy Lagoon Corporation Limited (ASX:RLC) today provided an update on lithium drilling at its wholly-owned Columbus Salt Marsh Project in Nevada, USA. Extensive volcanic ash deposits have been intersected in the current drill hole, indicating prospectivity for lithium, while the presence of brine has been confirmed in aquifer above the Target Zone. The Columbus Salt Marsh Lithium Brine Project is one of three lithium brine projects in Nevada, all of which are 100%-owned by RLC. The projects are located near North America’s only producing lithium brine operation, the Silver Peak Mine. Drilling of hold CBD-01 passed 750m depth late on Friday 23 March Australian time and is progressing well towards its target depth of 1,000m. The drill hole has intersected extensive thicknesses of locally derived clastic sediments and volcanic ash and tuff deposits which are interpreted to be derived from the eruption of Mt Bishop and the Long Valley Caldera 110 kilometres to the west. Of course, as with all minerals exploration, success is not guaranteed — consider your own personal circumstances before investing, and seek professional financial advice. The below MT survey profile shows the downhole depth as at Friday 23 March by the white box on CB-1. The blue box shows the approximate interval pump tested and sampled. Note that resistivity is the inverse of conductivity i.e. low resistivity equals high conductivity. The Mt Bishop Tuff is believed to be the source of much of the lithium in Clayton Valley and the presence of extensive deposits of these tuff and ash beds in the current drill hole is considered significant. 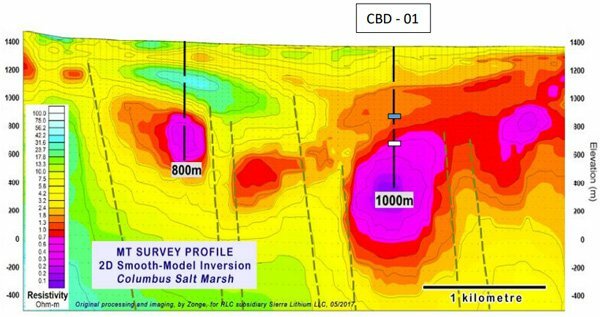 The drill programme at the Columbus Salt Marsh project is investigating a highly conductive zone extending from 600m (1,968ft) to more than 1,000m (3,280ft) below surface. A pump test was conducted approximately 200ft (61m) above the Target Zone in order to determine if brine is present. An aquifer within a zone of tuff and volcanic ash deposits from 1642ft (500m) to 1742ft (531m) was pump tested and sampled. The aquifer was confirmed to be brine with an average TDS of 48,803 ppm, and EC of 53,723 micro-Siemens per centimetre (μS/cm) (average of 11 consecutive readings taken over 2.5 hours of pumping), although assay detected no lithium in the brine sampled at this level. The elevated TDS and EC detected in the brine is consistent with the modelled MT data at this depth. 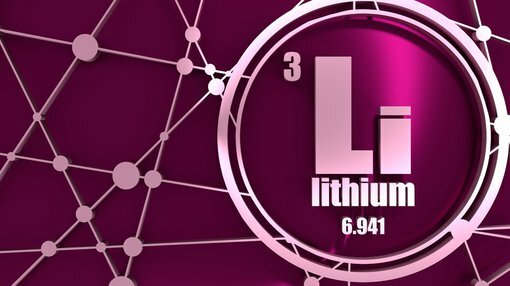 Further pump tests will be carried out within the Target Zone to test for lithium in the zone of maximum TDS and conductivity.